A few days ago, one of my customers was telling me about how happy they are about their increased Financial Reporting capabilities since they have integrated their Salesforce CRM system with their Microsoft Dynamics ERP system. This is actually one of the most valued gains from a CRM-ERP integration, one that benefits all, all the way to top management. We often take it for granted, as this is a gain that pretty much all of our customers benefit from, but it is definitely worth highlighting, as it makes a huge difference for all organizations experiencing it. Salesforce comes out of the box with awesome and robust reporting capabilities. But reporting is always only as good as the data that it fed to it. 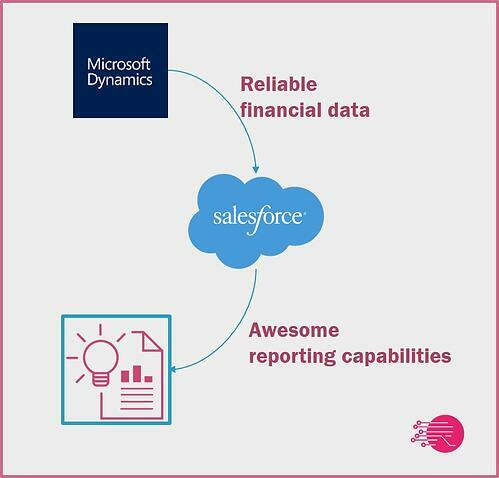 When you add to the Salesforce reporting functionality, the financial data from an ERP system such as Microsoft Dynamics, it simply becomes extraordinary – easy, precise and reliable. How does ERP integration improve data quality in Salesforce? Let’s say that a company receives a lead. The lead is created in their Salesforce CRM system. As the sales process moves along, the lead in Salesforce is converted to an account, a contact, and an opportunity. This is standard in Salesforce Sales Cloud. 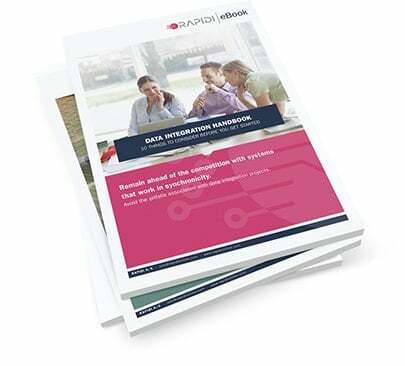 At a trigger point for instance, when the first quote is accepted, a transfer in RapidiOnline will create a customer, a contact and the order in the company’s ERP system (in this case let’s say Microsoft Dynamics ERP, whether it is AX, GP, NAV or 365 ). The integration will also secure that, moving forward, the record stay in sync. Since there is now an open sales order in Microsoft Dynamics, the sales order is being transferred back into Salesforce as a copy of the sales order. It can be displayed under an opportunity or an account - or wherever it makes most sense. Using RapidiOnline , you can also trigger additional workflows to notify your back office e.g. to make a credit check on the new customer, to review the order before it’s released or whatever you need in regards to your order fulfillment process. One of the benefits of working with our solution is that you can follow any changes to the order in Salesforce because RapidiOnline secures that the systems stay in sync. 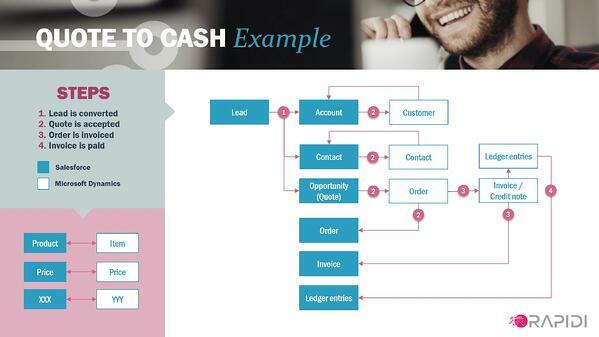 When an order is invoiced, it also syncs from the ERP system to Salesforce, and the sales order is consequently removed from the open sales orders in both systems and re-appears as a posted invoice. When the customer pays the invoice, the payment is shown as a ledger entry which enables you to follow the client’s balance and payment history directly in Salesforce without having to switch systems. The payments are balanced out with the matching invoices, giving a really good customer overview as well as possibilities for improved reporting directly from CRM. How can we help you improve your processes? RapidiOnline is designed to provide seamless integration between Salesforce and Microsoft Dynamics ERP, thereby providing you an easy way to improve not only your financial reporting but a number of other processes as well. To hear more about the possibilities, feel free to get in touch with us.